Wrought iron cocktail tables are appropriately named - The wrought iron cocktail table provides the ideal place to serve cocktails and coffee or lay out magazines for reading pleasure. Low and sturdy, wrought iron cocktail tables accentuate any sofa or seating arrangement and act as an anchor for the room. Tables are handcrafted by skilled blacksmiths using centuries-old techniques. Styles vary from trendy and round to rustic and rectangular. Browse our eclectic collection and click on individual cocktail tables for more details. Click to read helpful cocktail table information below. What wrought iron cocktail table styles will I find in your collection? What sizes and shapes will I find among wrought iron cocktail tables? We offer round, oval, square and rectangular cocktail table designs. Sizes range from approximately 43" wide x 27" deep to 50" W x 30" D. A few are well outside that average size. For instance, the Warehouse Cocktail Table by Charleston Forge is an extra long 72" by a very narrow 24" deep. On average our iron tables are 18 1/2" high, while some are a much shorter 16" and a few are up to 24" tall. What materials are used to craft your wrought iron cocktail tables? Will assembly be required for my wrought iron cocktail table? Yes, some simple assembly is required. Glass and marble tops are easily placed on top of the base. Wood, copper and zinc tops must be fastened to the table base with screws. Screws are included. Height - the cocktail table top should be close to level with the seating around it. Length - the proportion that seems "right" and is most visually pleasing is when a table measures two-thirds of the length of the sofa. Remember a sofa and cocktail table that are the same length will look unbalanced. Positioning - the optimal distance between a cocktail table and the sofa, loveseat, bench or chairs that surround it is 18 inches. That means when entertaining, the table will be within arm's reach so guests can easily set down and pick up drinks or snacks. In a follow-up to the Houzz Ideabook above, Becky proposes seven more questions to help you focus on your specific needs before selecting a coffee (or cocktail) table. Then she shares several interesting table options to consider. This interesting article offers ten things to consider during the coffee table selection process - from budget to functionality and alternatives to the traditional table. Learn more about cocktail tables from these blog articles written by our expert designers. "Go Glam with a Gold Cocktail Table"
Ready to add a glamorous look to your living room? 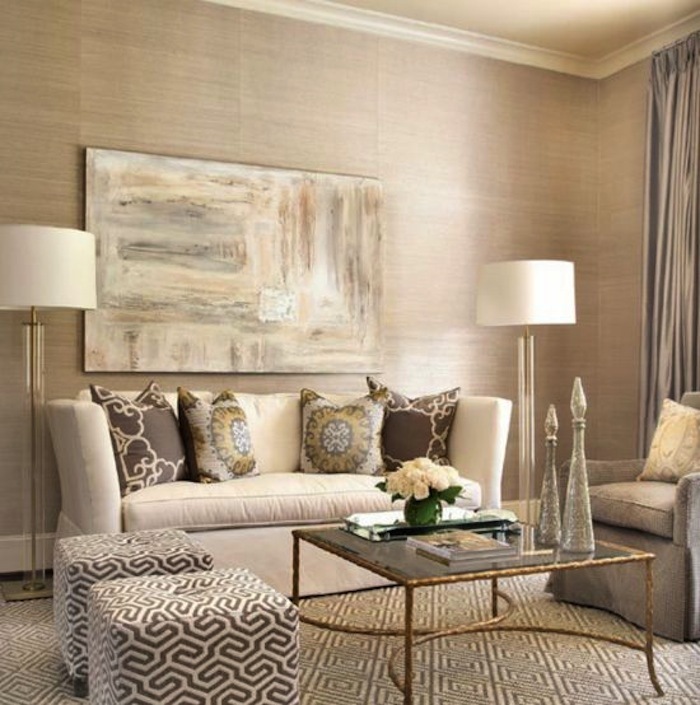 We love these stylish spaces with a touch of gold in this article. "10 Ways to Accessorize the Cocktail Table"
Need help styling your cocktail table? We're right here with fun and fabulous tips and ideas. For your decorating inspiration, we're sharing this helpful article.